WELCOME TO MES 2nd ANNIVERSARY CONCERT!!! 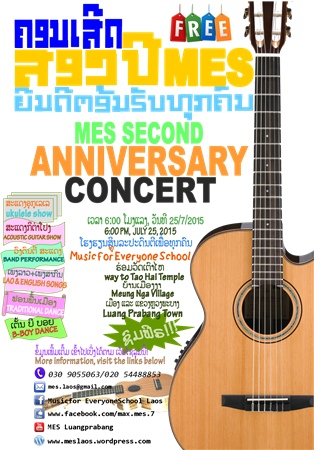 MES SECOND ANNIVERSARY CONCERT is coming soon on Saturday 25 /07/2015. The performance will start at 6:00 pm. There will be several shows on that evening, such as a single acoustic guitar and a single acoustic ukulele show, a group of acoustic guitar and ukulele show, bands perform English and Lao Pop and Rock songs. Also the traditional dance and b-boy dance will be performed. Don’t wanna miss it? Come along!